According to Barack Obama, “the President’s job is to make sure everyone has a fair shot.” But as I explained in Part I, the United States Constitution declares that a President’s real job is, “to the best of his/her Ability, to preserve, protect and defend the Constitution of the United States.” Whether or not Mr. Obama has abided by the true standard will soon be revealed, with the Supreme Court’s ruling on Obamacare. However, when judged according to his self-contrived measure, based upon his job performance to-date, Mr. Obama’s policies actually ensure that future generations of Americans will have ‘no shot’. In my post entitled, “Stimulus: How China Created 22.0 Million Jobs While Obama Squandered 3.3 Million,” I compared the goals of the Chinese government to those of the Obama Administration. The reason Mr. Obama’s stimulus plan fell short wasn’t because the federal government didn’t spend enough; China’s two-year stimulus package cost an estimated $595.4 billion, while the Obama Administration spent more than $830 billion. The main reason the Obama-Plan faltered was because it didn’t raise the bar high enough. You see, the Chinese government set a goal of reaching full employment, while the Obama Administration merely sought to create 3.5 million jobs, by January of 2011. The fact that Mr. Obama set a goal of creating just 3.5 million jobs, at a time when more than 15 million Americans were unemployed, is telling. Mr. Obama’s employment policies haven’t lived up to his self-contrived ideal of what a President should do. If a President’s job is to “make sure everyone has a fair shot”, then why didn’t Mr. Obama make full employment his objective? Wouldn’t this have been more consistent with a ‘fair shot’, than squandering better than $830 billion to salvage a mere 3.5 million jobs, while leaving 11.5 million people on the sidelines, to make due on unemployment benefits, welfare and food stamps? Although his repeated use of the catchwords “fair shot” may play well in politicking, if he means that everyone should have an opportunity to participate in the economy, then Mr. Obama has failed. 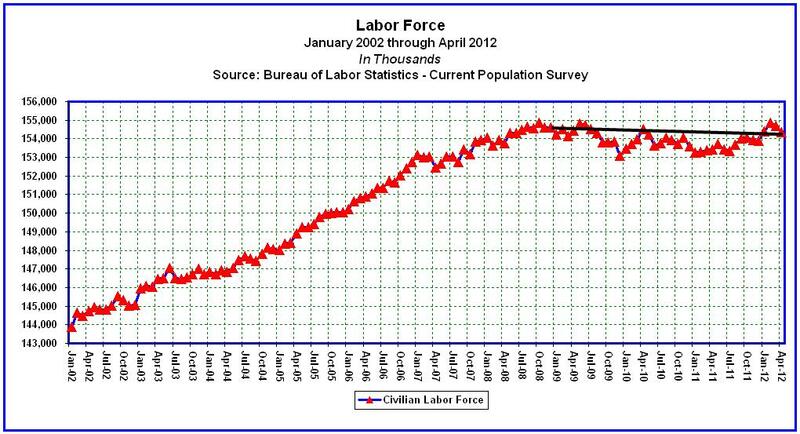 According the U.S. Bureau of Labor Statistics, since December of 2008, a month before his inauguration, the Civilian Labor Force has declined by 261,000 (from 154,626,000 in December of 2008, to 154,365,000 by April of 2012). See chart below. 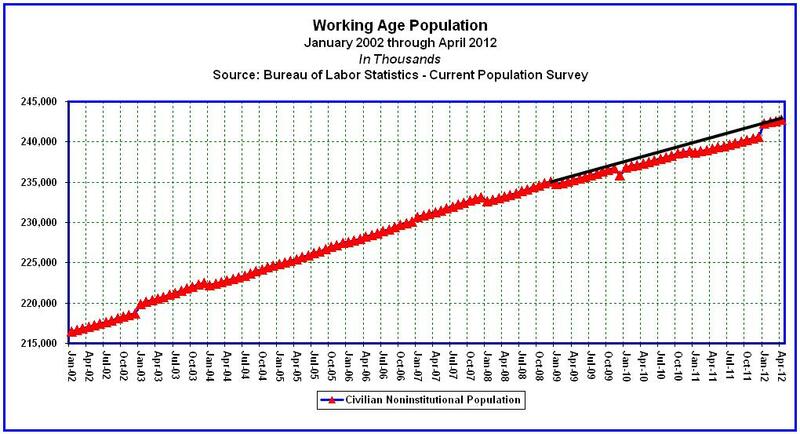 During the same time-frame, the Working Age Population (Civilian Noninstitutional Population) grew by 7,749,000 (from 235,035,000 in December of 2008, to 242,784,000 by April of 2012). See chart below. So while the Working Age Population has grown by nearly 8 million, during Mr. Obama’s term, the Labor Force has contracted by 261,000. Is the fact that nearly 8 million newly added Working Age Americans haven’t gotten a shot at participating in the economy, since Mr. Obama took the oath, consistent with his rhetoric? That depends on your definition of the catchphrase, “to make sure everyone has a fair shot”. 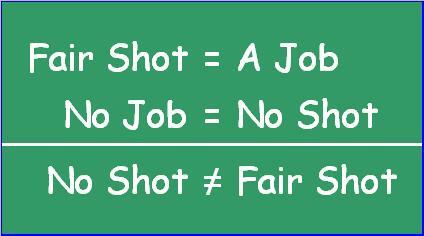 Is ‘no shot’ synonymous with a ‘fair shot’? To top it off, the Number of Working Americans (Employment Level) has declined by 1,463,000 during Mr. Obama’s term (from 143,328,000 in December of 2008, to 141,865,000 by April of 2012). See chart below. 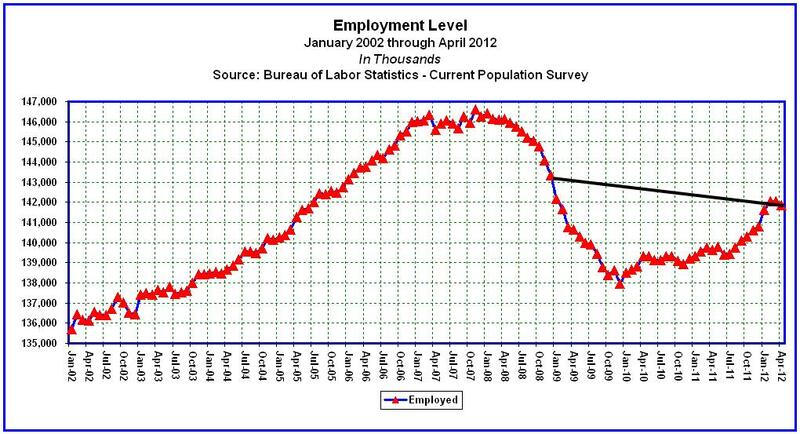 Has Mr. Obama learned the lesson and since shifted his policies towards a goal of full employment? Not as far as we know. All we hear from him lately is that everyone should have a fair shot, pay their fair share of taxes, and play by the same rules, as if this hasn’t always been the case. Aside from repetitious rhetoric, what grand policy is Mr. Obama now promoting to advance his goal of fairness? Will the act of raising taxes on millionaires, and everyone else for that matter, open up new opportunities for the next generation? If so, how does that work? Will offering tax credits to small business owners that hire more workers and pay them higher wages, while simultaneously raising their tax rates, do the trick? Not in my opinion (see Obama’s Economic Fallacy: The Not-To-Do List). The Bottom Line: Since Mr. Obama believes that his job has been to “make sure everyone has a fair shot”, and since the Labor Force has declined by 261,000, while the Working Age Population has expanded by 7,749,000, and the number of Working Americans has fallen by 1,463,000, all since the beginning of his four-year reign, and since he has taken a pass on making full employment his goal, it may be concluded that what Mr. Obama really means by the expression, a fair shot, is “no shot”. However you slice it, Mr. Obama had his shot, and failed. He has no shot at reelection.